Enjoy these One Pot Meals for busy nights when you need dinner on the table fast and with little mess. The last thing I want to think about on a busy night is a complicated dinner and a complicated mess to clean up. For more dinner ideas, check out these 50 Recipes with Shredded Chicken. 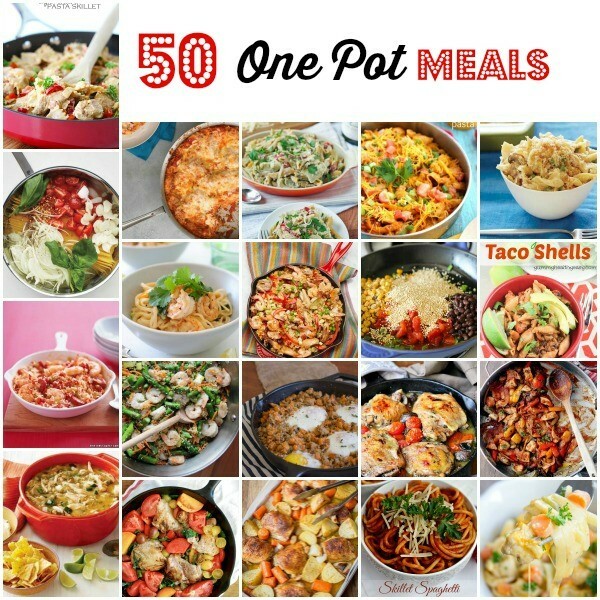 Did you get some great dinner ideas from this round-up on One Pot Meals? I hope so! I know I have a lot more ideas for school nights and even busy weekends when I need something fast and easy. This post is AWESOME!!!! I looooooove one pot meals! Thanks for including me! Pinned!! You’re welcome!! 🙂 Thank you for the pin! Oh wow! Great list of easy meals. Thank you Penelope! Hope you get some good meal ideas from the round-up. One pot meals are the best. Always my goto on busy nights. Awesome list. Thank you Julie! I need to remember the one pot idea much more on busy nights. I’ve added several of these to my menu for the next couple of weeks. Looks like a fabulous round up of quick and easy meals!! Thanks for including my skillet spaghetti! You’re welcome Julie! I can’t wait to try your recipe. It looks amazing!